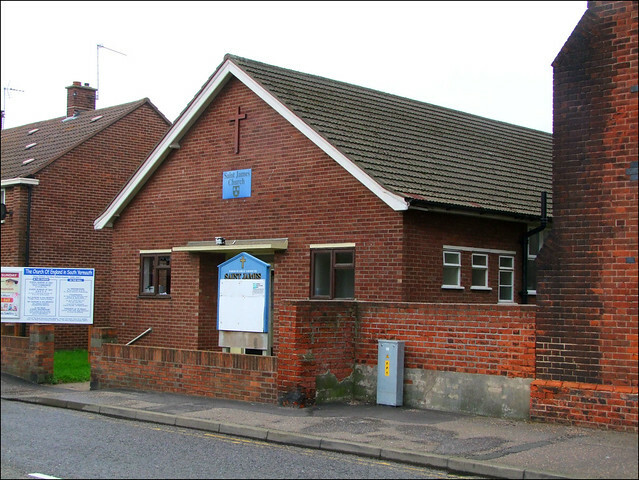 This little structure was built as a parish hall for JP Seddon's vast and grandiloquent 1870s church of St James next door, but when that was declared redundant in 1999 this hall became the new parish church. The notice board outside suggests that it has a busy life, which is not surprising as this little church is now the sole Anglican presence in the southern half of the Borough. I came here on the occasion of the Historic Churches Bike Ride of 2010, and was pleased to find the new St James open, especially as the old church next door was not, even though it was also Open Heritage weekend. However, it turned out that the church was not taking part in the bike ride at all. Instead, a rather bemused workman was busy cutting up wood at the back of the church for a kitchen conversion. He told me that I was the sixth visitor since he'd started work, and this despite the fact that it was not yet midday. He asked me to explain what the Bike Ride was, and when I showed him my signing in form he became quite interested, and even asked me if I thought he should sign the forms for visitors if any more came, but I assured him that this would probably only complicate matters. He was quite happy for me to have a look around, although of course there was not a lot to see. The old church had a vast marble font which would be quite out of place here, and instead there is a little wooden birdbath. The former use of the building is obvious from the proscenium archway around the stage at the west end, but the curtains now serve a slightly different function, because they allow the sanctuary to be screened off so that the body of the building can be used for more secular purposes during the week. I wondered what JP Seddon would have made of it.